Juveniles spend one to three years in freshwater before migrating to the ocean. 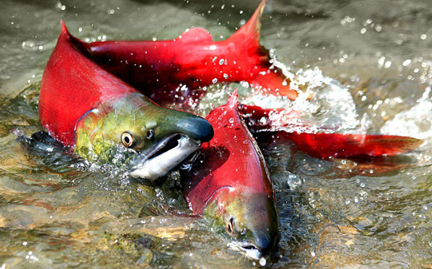 In preparation for migration to the sea from lakes and rivers, sockeye salmon gills and kidneys begin to change to process salt water. At sea, they are metallic blue and silver, but at spawning, adults display bright red bodies and green heads. They usually remain at sea for two years and then return to spawn. At maturity, they all migrate back to their natal freshwater, spawn and die. Males compete for females and females compete for the best gravel nest site where they deposit 2,000 to 5,000 eggs.